This entry was posted in Cancer, Causation, Consumer, Controversy, Corn, Correlation, Credibility, Crops, Fear, Flavr Savr Tomato, Food and Nutrition, Food Security, Global population, GMO, Medicine, Mortality, Paranoia, Pigs, Research, Science, Scientist, Technology, World Hunger and tagged #Feedthe9, Cancer, Corn, Flavr Savr Tomato, Food, Food Safety, Food Security, GMO, Health, Healthy, Hunger, iPhone, Medicine, Productivity, Science, Technology, War, world hunger. Bookmark the permalink. In a world where scientists are interested in human benefits and low environmental impact the correct answer is not some arbitrary metric. If we accept that corporations are just all about quarterly profits, then they’ll be sure that tests are airtight as to avoid even the hint of adverse reaction and the weight of lawsuits. Shortsighted testing benefits nobody. The answer? The sufficient amount of testing is “enough”. Enough is based on the trait, the gene that controls it, where it comes from, known effects in humans, and projected risk to the environment. People opposed to the technology find this answer disturbing. They want simple, hard dates with long time horizons. It is not a call for adequate scientific assessment. It is a call to make such assessment unattainable. Absolutely right. Given enough red-tape and restrictions, anything can be effectively banned while the opponents simply say “We just want to make sure all the proper safeguards are in place before we use it”. Ironic that the doctors and scientists should be the ones to figure it out, yet any doctor or scientist who is pro-GMO is usually accused of being a corporate shill. Florence Wambugu said it well when she said the west is entitled to debate GE crops but can we eat first? Food is an emotional issue, but why is it so different than any other advancement? Time for everyone to brush up on some philosophy of science. We never prove scientific theories. We dis-prove them. And as long as we fail to disprove something, it stands. This is what Karl Popper referred to as falsifiability or refutability. 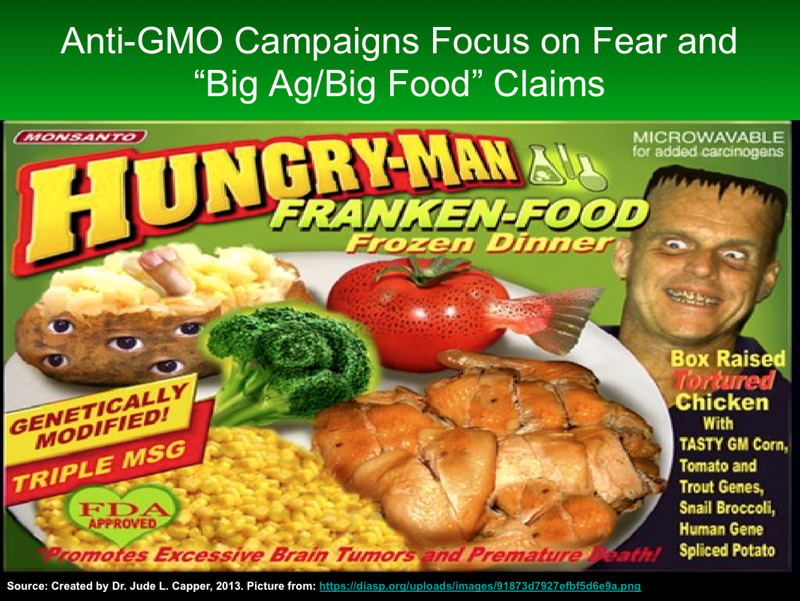 No amount of evidence will ever satisfy anti-GMO organic activists. We will only ever know that GMO foods are safe as far as we know. Meanwhile, there’s ample evidence that due to the laxity of organic-standards enforcement, organic foods are far from safe. Its quite easy to criticize or complain on a full stomach. A common conversation I have with producer clients is that the consumer has NO concept anymore of where their food comes from or how it is produced (or made more productive or more disease or insect resistant, more drought tolerant, etc.) Similarly, threats to modern food and fiber production are not from market variance or weather challenges but from governmental regulation or the demands of a poorly informed consumer base. I think the controversial issue here is not really GMOs, but glyphosate. THAT should be addressed.